Kanishka Raffel, Colin Buchanan, Elizabeth Meyers, Roy Williams and Joan Reilly at the Arthur Stace service in Sydney. Another secret in the mysterious life of Arthur Stace, who spent decades anonymously chalking the word “Eternity” on the streets of Australian cities, was uncovered on Sunday. At a commemorative service at Sydney’s St Andrews Anglican Cathedral, Joan Reilly shared how, as a six-year-old, she saw Stace chalking the word “Eternity” near her home in Balmain. She is the only living witness to his chalking the word during those years when the identity of the person writing Eternity on the streets, in elegant copperplate, was a total mystery. 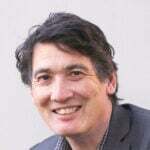 The story of Stace being dramatically saved from a life as an alcoholic, living on his wits in depression-era Sydney, was retold by Kanishka Raffel, Dean (minister) of St Andrew’s Cathedral. “I went in to get a cup of tea and a rock cake but I met the Rock of Ages,” is how Stace described his visit to a Sydney church that changed his life. Raffel recalled Stace’s reaction to this event: “I found that Christ was stronger than drink.” Stace left that service at St Barnabas, Broadway, and crossed the road into a park near Sydney University. Under a Moreton Bay fig in that park, Stace gave his life to Christ. “In contemporary politics, we ask the question: ‘How can we be on the right side of history?’ But will we be on the right side of eternity?” Raffel asked. He linked Stace with Jesus’ story of the despised and corrupt tax collector and the Pharisee (religious leader) praying at the temple, from Luke chapter 18. … this inspired Stace, who just happened to have a stick of chalk in his pocket. 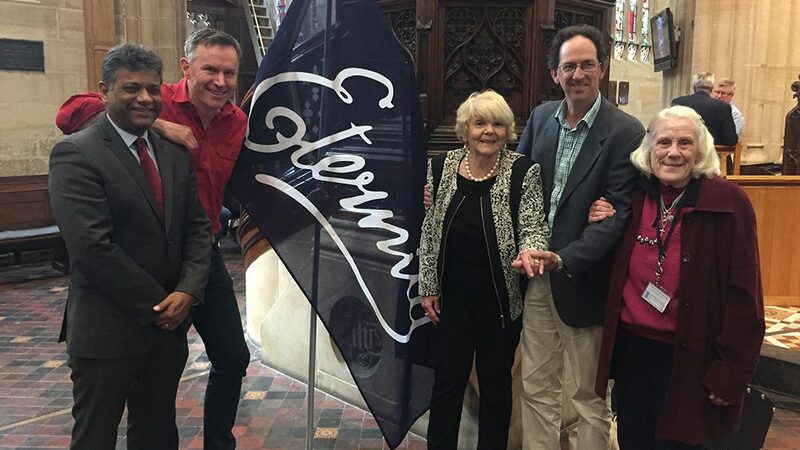 A forthcoming book written by Roy Williams and Elizabeth Meyers, Mr Eternity, will include how Stace was challenged by evangelist John Ridley at the old Burton Street Baptist Tabernacle. Ridley wished that he could spread the word ‘Eternity’ to the streets of Sydney; this inspired Stace, who just happened to have a stick of chalk in his pocket. Authors Williams and Meyers were at the Cathedral service yesterday and met Joan Reilly for the first time. They were excited to meet the only living witness to Stace writing “Eternity” on Sydney’s streets. While Stace was finally unmasked in the Sunday Telegraph, some secrets do still remain. However, more will be revealed in the book Mr Eternity when it is published in October. Pray that as people remember the 50th anniversary of Arthur Stace’s death, they also stop to think about the “Eternity” he pointed to so prominently.